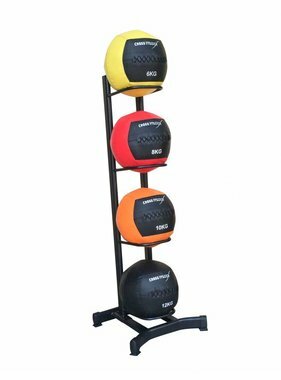 The LMX1246 Wall Ball rack (black) is great for storing the LMX1245/LMX1243 Crossmaxx® wall balls! The rack is made from black, powdercoated steel tubing and swivel castors so it can be easily moved. The LMX1246 Wall Ball rack (black) holds up to twelve Crossmaxx® wall balls. There is also room for LMX1250 medicineballs on top. The rack is suitable for intensive commercial use.